Amla rasayanam chakre brahma varshsahasrikam. Jaravyadhiprashamanam buddhindriyabalpradam. Bhavantyamritasamyogattani yavanti bhakshayet. Jeevedwarshasahasrani tavantyaagatayouvana. Etat rasayanam purvam vashishta kashyapoingra. Jamadagnirbharadwajo bhriguranye cha tadvidhaa -- Charak. According to the `shastras` amla enhances the life span, brain power, treats deformities and strengthens all other organs. It is said that this tonic was prepared by Brahma and used by Vashishtha, Kashyap, Angira, Bharadwaj, Jamdagni and Brugu seers, which kept them away from all diseases and old age. This also treats eyes, hair and stomach related diseases and makes the body healthier. Gold and other precious metals not only enhance beauty but also give life too. The medicines prepared of mercury and its different minerals and sulfur etc. are called `ras rasayan`. Mercury is used in very small quantity even then it enhances the quality of the ingredients, with which it is mixed. Hence, the `ras rasayan` is very important in this medical branch but the refinement of mercury needs extra cautions. The preparation of its products need much labor and time and we keep special attention of it. When many injections or concentrated drugs like sulfa drugs fail and the diseases were left as incurable where as the use of ayurveda `ras rasayan` has given relief to several such patients. 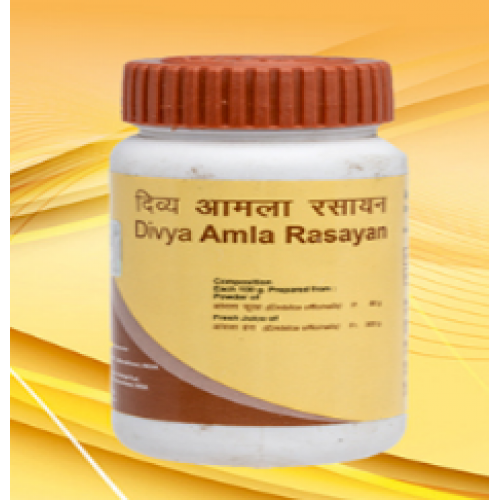 Ras-rasayan, prepared by Divya Pharmacy is at very cheap prices with high quality as compared to other pharmaceutical companies. The medicines are prepared according to the methods described in the ancient texts. Dose: 2-3 gram twice daily empty stomach with water or honey or as directed by the physician. Indications: Useful in hyper acidity, weakness of eye sight, hair falling, general debility, chronic constipation etc.